2013 '13' reg with 8384 miles. Arancio Argus with Nero Ade Leather and Arancio Dryope Contrast Stitching, Dion Forged 20" & 21" Wheels in High Gloss Black, Heated and Electrically Adjustable Seats, Carbon Ceramic Brakes with Orange Calipers, Multifunction Steering Wheel in Perforated Leather, 'Sensonum' Premium Surround Sound System, Park Assist Sensors with Reversing Camera, Transparent Engine Bonnet, 'T' Engine Cover in Carbon Fibre, Roof in Body Colour. Full Lamborghini Service History. 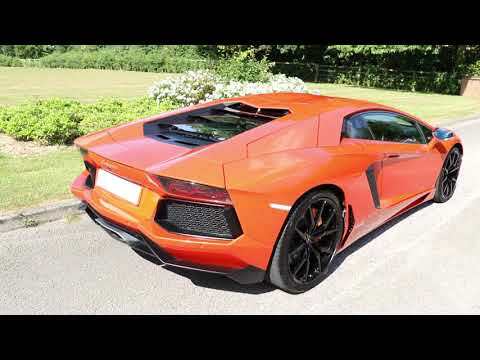 This Aventador is in Exceptional Condition and the Pearl Effect Paint Looks Amazing, especially in direct sunlight. Every retail vehicle we sell is put through a Main Agent prior to handover for a Used Approved Car Check or service, and is handed over with a clean bill of health. This gives you, the potential buyer comfort in knowing that we take our preparation very seriously. Some websites such as Car Gurus copy adverts from our site and remove all of our contact details. In this case please visit our website www.clinkardcars.co.uk for full specification and pictures, or call us on 01794 323330. Thank you.